Do I need to seal my granite countertops — and if so, how do I do it? How often do granite countertops need to be resealed — and which products should I use? What happens if you don’t seal granite countertops? We’ll answer those 3 questions — and more! That is the question that most people ask before making a granite countertop purchase. And if your granite countertop was installed awhile ago, then you’re probably wondering if you need to reseal granite or not. When I spoke to Jeremy and Edward at M&F Business Corporation, a granite slabs importer that sells wholesale to fabricators here in Georgia, their answer was that all granite must be sealed. Usually, granite is sealed at the factory and after the fabrication process. So the chances are good that your granite countertops have already been sealed — at the factory and/or upon installation in your home. The real question is whether it’s time to reseal your granite countertops or not. The question you should be asking is: When should you start resealing granite countertops? 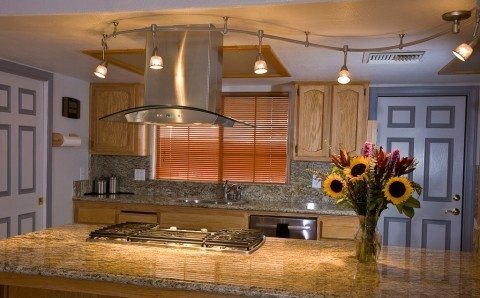 How Often Do Granite Countertops Need To Be Resealed? How often you cook in your kitchen. How much wear and tear you put into your countertop. How you clean your granite countertops (whether you use chemicals or not). The quality of the granite sealer that was applied previously. How absorbent your granite countertop is right now. Typically, a factory-applied granite countertop sealer lasts 10 years or more. I asked Jeremy how often homeowners need to apply a sealer to their countertops, and his reply was that the installers can apply a granite sealer that will last 20 years or longer — so be sure to ask for that, if you’re involved in the installation process. Generally speaking, most people reseal granite countertops every 1 to 3 years. TIP: Use the simple DIY tests below — to determine if your granite countertop has already been sealed or not, how absorbent your granite countertop is at the moment, and when you should be prepared to reseal it again. Fortunately, the process of sealing granite (described below) is really simple to do! You need to see how absorbent your granite countertop is at the moment — the more absorbent it is, the more it needs to be sealed. There are 2 ways to test a granite countertop (or any stone countertop) for absorbency, and also determine if the stone is mixed with calcite or other minerals that are sensitive to acidic spills. NOTE: Having the smallest amount of calcite in your granite countertops will make them more susceptible to stains and markings — due to a chemical reaction with acidic liquids like lemon juice, orange juice, household cleaners, and more. Line your granite samples on a table with the polished side up, and then dust them thoroughly. Spill a few drops of lemon juice and cooking oil on each one of them. Be sure to use different spots on the surface of the stone for the juice and oil. Let the lemon juice and the oil sit on the surface of the stone for 5 minutes or so, and then wipe it dry. If you notice dull spots where the lemon juice hit the surface, you do not want this granite for your kitchen countertop. This “granite” is mixed with calcite or other acid sensitive minerals, and maintenance will be a nightmare! If the stone surface turns dark almost immediately, you do not want this granite for your kitchen countertop. This “granite” is extremely absorbent and you will be a slave to it! If it takes 30 seconds or a little more to turn dark, then you may have a stone that can be controlled with a good quality impregnator sealer . If it takes more than 5 minutes, then you have a stone that probably doesn’t even need to be sealed! Here’s some more information on how to seal granite. Drip a small puddle of water on your stone. That’s it! If it darkens quickly, you should seal the granite with a few coats and re-seal it every 3 years. Always wipe up any spills ASAP. If the stone takes 4 to 5 minutes to darken, a good impregnator sealer should be applied and re-applied every 3 to 5 years. If the stone darkens in 10 to 15 minutes, apply one coat of sealer then check it again every 3 years or so for absorbency. If the stone darkens in 30 minutes or not at all, consider yourself lucky and sealing may not be necessary due to the hardness of the stone. Refer to the instructions if you are still unsure of what to look for or how to interpret the test. A topical granite sealer sits on top of the stone and coats it. An impregnator granite sealer is typically your best bet because impregnator sealers actually penetrate below the surface of the stone — restricting water, oil, and dirt from entering the stone. Personally, I apply a fresh coat of impregnator sealer to my granite countertops every 2 to 3 years. Whether you decide to go with a topical granite sealer or an impregnator granite sealer, one thing’s for sure: your granite countertops must have one or the other! It’s important to note that sealing granite countertops does not make them 100% stain resistant — because granite is a naturally absorbent material, and certain liquids will find a way to leave a stain if you’re not quick to clean it up. Sealing granite merely gives you a little more time to clean up spills before they eventually seep into the tiny fissures that naturally appear in granite slabs. Sealing granite is a very simple DIY project. Simply wipe a granite countertop sealer on. Let it set about 30 minutes. Be sure to follow the manufacturer’s instructions for the granite sealer you chose. Absorb food, grease, and liquids — causing set-in stains on your countertop. Absorb water — making the countertop always look dirty. Absorb chemicals that are in cleaning products — which will discolor and damage your countertop over time. Unsealed granite is not wise for any countertop. Here are the differences between an unsealed granite countertop and a sealed granite countertop. TIP: Whether your countertops are sealed or not, you should not use citrus-based cleaners — because citrus quickly wears off any granite sealer that was applied, and (even worse) eats away at the calcium that is naturally in the stone, leaving pits and etching. Is your granite countertop already stained? Looking for some advice on removing stains from granite? There are a few different products on the market for granite stains, but you will need to know what caused the stain in order to effectively remove it — it’s a molecular-level, chemical kind of thing. HMK has a line of stain removers based on what caused the stain. Miracle Sealants also has a few specialized products for unique granite stains. 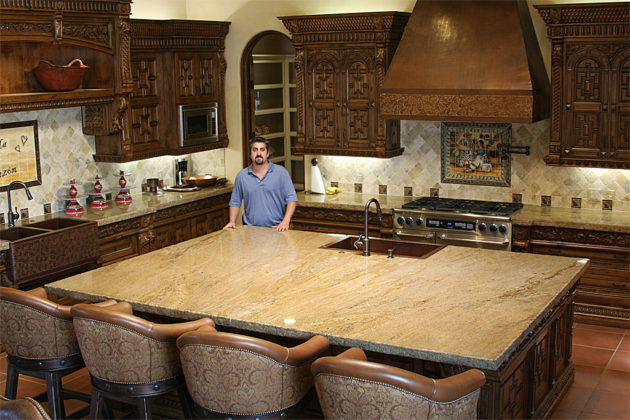 Granite is an awesome choice for countertops. But like anything worth having, you must take proper care of it if you want it to last as long as possible (or indefinitely, like it would naturally). Here’s how to remove stains from granite countertops.